← You think creationists use bad science? Try talking to the anti-GMO crowd! 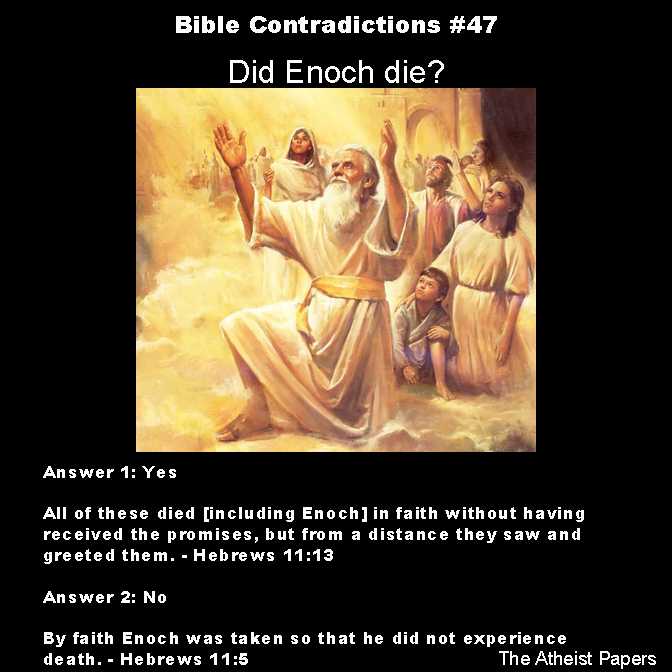 Bible Contradictions #47: Did Enoch die? I previously tackled the does-everyone-die contradiction. I briefly mentioned Enoch in that post. This one expands on Enoch and raises another contradiction. In order to answer the question of whether or not Enoch died, all we must do is read Hebrews 11. Most of the contradiction is found in this chapter, although the non-death death of Enoch also appears in Genesis 5:24. This book begins by making examples out of Abel, Enoch, and Noah to show how faith is rewarded. In verse 5 Enoch’s faith is so strong that god rewards him by making him vanish into thin air. Instead of dying a physical death, god takes him (and his physical body) up to heaven. By verse 8 we bring Abraham and eventually Sarah into the conversation. Now we are talking about the rewards of faith of five people. But then in verse 13 everyone mentioned in the previous verses dies, including Enoch. This is one of the funnier contradictions because it’s made in a single breath. I’m not quite certain why it wasn’t caught prior to publication. All they had to do was insert “except Enoch” in verse 13. It’s as simple as that! This entry was posted in Atheism, Bible Contradictions and tagged Atheism, atheist, Bible Contradictions, Christianity, Christians, contradictions in the bible, Enoch, God, Jesus, Religion, the bible. Bookmark the permalink. 1 Response to Bible Contradictions #47: Did Enoch die? I think an asterisked and/or annotated bible is an excellent idea!